How do you make your money? By keeping the spindles turning, right? But when do they stop? Sometimes when you’re out of material, sometimes when you break a tool, but mostly they’re stopped during setup. To reduce setup time is to increase spindle time. What would happen to your setup time if you could take tool setting out of the machine and do it offline? The program needs to know where the cutting tool is with respect to program zero. If all toolholders and tools were exactly the same and dimensioned exactly according to their specifications, you could just install the tool in the holder, put it in the machine and run. In the real world, of course, everything has a tolerance. One tool’s tip may be a few thousandths lower or higher than its nominal location, but once the CNC program knows how large this offset is, it compensates. So when you’re setting up a new job on a CNC machining center, no problem. You just touch off each tool to teach the program what the offset needs to be. Touching off a tool doesn’t take all that long. Maybe a minute or two. But multiply that by all the tools for a job and it can add up to an hour or more – per setup. And time is money. Think about it: Maybe it would be worthwhile to look into setting those tools out of the machine. Since CNC machines can compensate for that offset, when you “preset” your tools outside the machine, you’re not really setting them. You’re really measuring them to be able to tell the CNC program what the offset is going to be for each tool. Install the tool in a toolholder. Then fixture it somehow and measure. The process is something you could do with a surface plate, some parallel blocks and a dial indicator. But you probably wouldn’t want to do that more than once or twice. That’s why there are lots of companies making equipment that will help you do the job. The simplest presetters work like that dial indicator setup, but are more convenient. Place the toolholder (upside down) in a fixture, and then use a dial or digital indicator to find the tool tip location. You read the projection length dimension, and need to write it down next to the tool number and later transfer the offset information to the program. The next echelon of presetters use an optical-comparator type shadow image to home in on the tool tip. Again, place the toolholder in a fixture, and turn an adjustment knob to place crosshairs on the tool tip. This type of presetter often has a digital output, from which you read the dimensions. In addition to determining the offset, you can also measure runout on these presetters by aligning the vertical crosshair with the part and rotating the toolholder in the fixture. Medium and high-end presetters use video to locate and examine the tool tip. 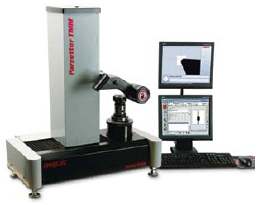 Besides measuring length (offset) and run out, these systems have the ability to measure the shape of the tool profile – dimensions, radius, angles. Why would you care about the tool geometry? Sometimes your tools may not be what you expect. Tom Smith, operations manager, EverFab, Inc., East Aurora, N.Y., told about a time before his company had a presetter, when they could have used this geometry feature. They were machining a large radius on an aerospace part with a ball end mill, and the radius of the part kept coming out wrong. They laser calibrated the machine. They laser calibrated the CMM (coordinate measuring machine), and both came out OK. The only thing left was the tool. It turned out, Smith said, “the radius of the tool wasn’t really spherical.” By trying ball end mills from different manufacturers, they found one that was the correct shape and would do the job. Now, however, with a video-based presetter in house, it would be easy to check the tool shape. “The Parlec allows us to inspect that . . . you can verify the geometry,” he said. Presetters vary in how they retain the toolholder in the fixture during measurement. The more basic units use gravity. You place the toolholder in the fixture and that’s that. Higher end presetters pull a vacuum to hold the tool in place. The most sophisticated presetting systems clamp the tool in the same way it will be held in the machine. With the lower-end presetters, dial-based or digital readout, you need to write down the measurement data and transfer it yourself to the CNC control. Some digital readout versions will print out a report and/or a tool label. The computer-based units can send the tool number and measurement data to be stored on your plant’s computer network. Then, when the tool will be run, the controller can download the necessary information. All this data is good, but it’s only useful when the correct data is tied to the right tool. Some of the computer-based presetters will print a barcode label for the tool. 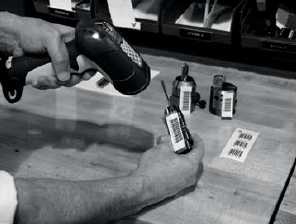 Then, at setup time, you use a handheld barcode scanner to read the tool number from the label. The control can look on the network for offset data for that tool. The latest identity technology is radio-frequency identification (RFID), now available on some high-end presetters. The RFID chip (similar to the chips used to identify pet dogs) is attached to the toolholder and the presetter programs it with the data about the tool. An RFID reader in the machine reads the information from the chip. The highest-end presetters, have all those machine vision and computerized features. In addition, they make the measurements automatically. Place the tool/toolholder in the fixture, press a button, and the presetter measures the tool dimensions according to a program, uploads the data to the network, and maybe programs an RFID chip for the tool. Suppliers recommend these large units for shops that plan to preset a hundred or more tools per day. Presetters of any kind are not cheap. Prices vary across the many types of presetters, from indicator type to middle-of the- line to fully automatic, and among the different vendors. A very basic dial presetter might be around $2000, and a simple unit with backlit viewing and a digital readout around $10,000. Video-based systems start near $20,000 and go up from there, depending on capability and options. The large, fully automatic CNC presetting systems can run to $75,000 – $100,000, or more. How could you possibly justify spending $100,000 or even $20,000 on a piece of equipment that just hangs out in the tool room and doesn’t produce any parts? Just take a look at how much spindle time you lose by setting up the machine. Suppose you have 15 machining centers. On average you change jobs daily, and on average you have 30 tools per job. If it takes one minute per tool to touch off during every setup, this leaves each spindle idle for an extra 30 minutes every day. Fifteen spindles x 30 minutes = 450 minutes per day. That’s 7.5 hours. If your machine rate is $50 per hour, those 7.5 hours cost you $375 per day in lost time, $1,875 per 5-day work-week, $93,750 for a 50-week year. Cut that in half for realism, and it is still money. Convincing management to spend the money for a presetter is just part of the process of changing over to tool setting outside the machine. Employees must learn the new system and learn to trust it. EverFab, Inc., East Aurora, N.Y., has been using a Parlec Series 2500 CNC presetter for several months now. Setting tools on the machines (5-axis Mazaks) had been taking about two minutes per tool, so the company was looking to reduce spindle downtime, said operations manager Tom Smith. To help build confidence on the floor, one of EverFab’s head machinists has been working on presetting the tools, along with staff in the tool kitting area. “This was a good thing to do, to involve the guy who usually does setup,” Smith said. It was important for staff to understand “This is what we do, this is how we do it, and this is why.” Setup times are down and now the company is finding that it can use its scheduling software to help make sure the next job is ready to go when the machine is. The process of changing over to presetting has gone very smoothly, he said. Presetting your tools can reduce setup time on the machine and free up that much more machining time. As you consider presetting, also notice the other activities that may be unnecessarily extending setup time and think about how you can streamline the process even more. Do you have setup sheets? Does the setup person have to search for a wrench? Does the setup require making multiple trips to the tool room? You have control over these things, too. You can write setup sheets for each job, have the tool room kit the tools, and make sure hand tools are close at hand. It’s common sense. It’s also called “lean manufacturing.” Call it what you like, but it’s all about making your shop more efficient and profitable. And presetting can be an important part of creating that kind of success. Non-CNC machines can use presetting, too, but the process is a little more involved. Presetting, in its original meaning, was to precisely set the tool projection length and other parameters before installing it in the machine. And that’s what needs to be done if there’s no CNC capability to compensate for offsets. 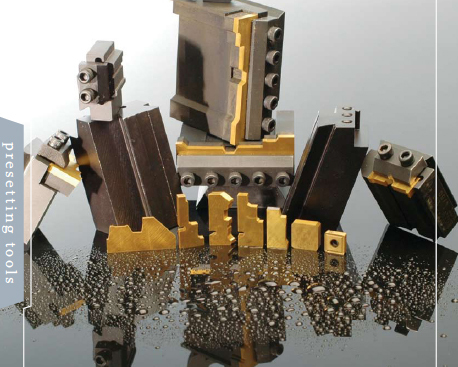 For screw machines, there are many quick-change tooling options, where the toolholder is fixed in the machine and inserts or removable tool holding adapters can be changed out easily. One system for screw machines, Datum Line Tooling from Reynolda Manufacturing Solutions, Lewisville, N.C., is designed for families of parts. So you can set up a dedicated machine to produce similar parts without having to completely set it up each time. Selecting a datum line, usually relating to the cutoff tool, Reynolda designs the system so that toolholders are installed in the machine and stay there, but you change out the inserts and anvils for each different part, said Andrew Egbert, one of the partners at the company. The toolholders really do stay put, he said, illustrating with story about a Reynolda customer. At this customer, Datum Line Tooling was installed and the operators were instructed how to use it, including the fact that the toolholders never needed to be moved or adjusted. However, someone kept adjusting the toolholders. To keep this from happening any more, one of the managers welded the toolholders in place. And, eight years later, Egbert said, the toolholders haven’t moved and the machines are still making that same family of parts. For a very complex machine like the Hydromat EPIC R/T rotary transfer system (Hydromat, Inc., St. Louis, Mo. ), setup can be a very time-consuming process, with multiple tools at each of 12 or more stations. Hydromat offers a presetter that can set up each head outside the machine, including tool center height, said Max Bebie, vice president of sales technical services for Tornos and Hydromat. In fact, for extremely precise work, offline presetting is really necessary, he says. The CNC capability of the machine can also be used to compensate for measured offset, but the presetter is still necessary to make the measurements.